Cross Stitch Happy: Floss Tag Exchange From Deb! Just a day or two after the exchange from Becky arrived, I was treated to another great exchange package, this time from Deb H for the HoE Floss Tag exchange. 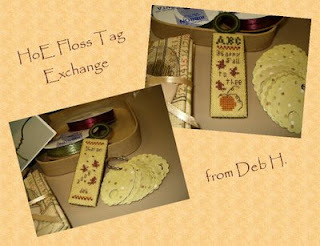 Deb did such a great job on this exchange, not only on the beautiful stitching and finishing of the floss tag which I just love (more leaves and pumpkins! - It goes well with the piece from Becky, don't you think?) but all the extras were a delight as well. The coordinating paper floss tags are wonderful and Deb tells me she made them herself! 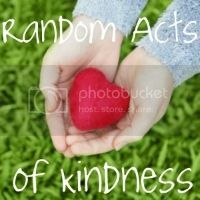 I've been wanting to make some of these but my punches all seem to be too big or too small or the wrong shape, etc., etc., so I was very happy to receive them. 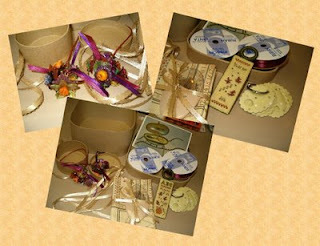 She included some really cute finishing fabrics, needles, ribbons and the papier-mâché boxes it was all packaged in. She also included a really cute beaded bookmark that a friend of hers made - very colorful and jangly - love it, but I decided to use it as a doorknob decoration and it looks great! 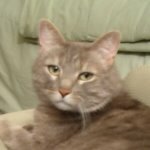 Thanks so much, Deb, for the wonderful exchange! 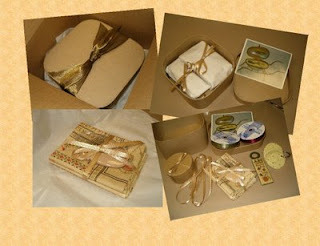 I love the sparkly ribbon the box was tied with! Very nice exchange! Wonderful goodies and such a pretty floss tag. Beautiful! I'd love to know how she made her paper floss tags. Wow!! Another great package!!! The floss Tag is beautiful!! What a beautifully wrapped exchange! The floss tag is gorgeous, enjoy!